As early as 1852, Jews began arriving in Brookhaven from places along the Mississippi River including Port Gibson, Natchez, and Vicksburg. Initially, they worshipped together in private homes. By 1894, the Jewish community was growing large enough to support a more permanent house of worship. As a result, the local Ladies’ Hebrew Society led the effort to form a synagogue, which soon became the foundation for Congregation B’nai Sholom. The congregation began meeting in Heuck’s Opera House. In 1896, the Jewish community of Brookhaven built its first temple through the use of fundraising letters sent to the trading partners of local merchants. These partners, Jewish and non-Jewish, contributed to the campaign, and the congregation constructed a Gothic building with stained glass windows and a bell-less steeple at the corner of Chickasaw and Church streets. 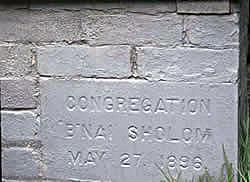 Rabbi Isidore Lewinthal of Nashville, a relative of many local residents, presided over the cornerstone laying on May 28 of 1896. With a Jewish community that never exceeded 100 people, members of B’nai Sholom took it upon themselves to continue the practices of Judaism. Without a fulltime rabbi, congregation members served as lay leaders throughout B’nai Sholom’s history. Sometimes rabbis from other communities or student rabbis from Hebrew Union College would lead services. Jews from such nearby towns as Hazlehurst, Wesson, and Crystal Springs came to worship in Brookhaven since these towns had no temple. Many children of B’nai Sholom were confirmed at the temple in Natchez. The Jewish community of Brookhaven continued to be strong until World War II, when the next generation of the Jewish community began to leave and pursue other careers in more urban environments. Despite that trend, services continued to operate on a weekly basis as well as religious school until the 1970s, when the congregation began to limit regular worship to High Holidays, though the synagogue continued to hold b’nai mitzvot and weddings when needed. 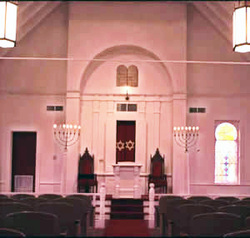 Until 2009, it was the oldest synagogue in Mississippi still in use. 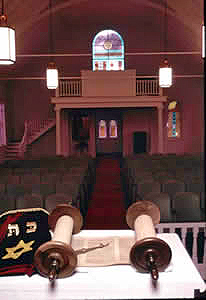 The congregation owned two Torahs. While Rabbi Isidore Lewinthal wrote the first one in the late 1890s, the other was a Holocaust Torah from Prague. While the synagogue certainly symbolized Jewish life in Brookhaven, other institutions of a Jewish community existed as well. In 1898, B’nai Brith formed the Abrams Lodge for fraternal and service activities, yet the small size of the Jewish community caused the group to be short-lived. While holiday celebrations usually occurred in the temple itself, some events produced the true meaning of a Jewish community. The community Passover Seder often occurred in the dining room of a restaurant or in a private home, where people would join in celebrating the best aspects of the important holiday. Brookhaven was always home to a small Jewish community. Despite never having a full-time rabbi, B'nai Sholom managed to serve Jews in and around Brookhaven for over a century. On August 30, 2009, the congregation held an official deconsecration ceremony to mark the closing of the congregation and synagogue. The remaining members entered into an agreement with the Lincoln County Historical Society for the temple to be used as a museum of local history, which will feature the history of Brookhaven's Jewish community.